DeepBlue Games is introduced to computer users as a game manager that allows playing games available at deepblugames.com. Although users are required to install this program to play games, we suggest finding a more reliable game source. According to our research, this program will start injecting annoying pop-ups and commercial advertisements as soon as you install it onto your computer. Unfortunately, these advertisements could be misleading and unreliable, but most computer users realize this after interacting with them, and it might be too late to go back at that point. Some ads are so malicious that they can activate malware installer at one click. Of course, ads could also be used to boost traffic to unpopular sites that are harmless. In either case, there is no doubt that there is a certain risk when using this tool, and, if you are not willing to take it, we suggest removing DeepBlue Games. The publisher of DeepBlue Games is Credible Apps, but it was created using the Pull Update engine. When it comes to the distribution of this ad-supported program, everyone’s story might be different. Some users will download this suspicious adware program via deepblugames.com or the Chrome web store at chrome.google.com/webstore/detail/deepblue-games/ejdhoehcngkafohlpbpbhbhbgbboefia (both installers are currently down). Others will acquire it via software bundles. Unfortunately, different installers could be used to spread this adware, and it could be packaged with different programs in every case. All in all, it is very likely that additional programs will slither in along with this adware, which is why you should run a malware scanner after detecting it. According to our researchers, the official engine used for the distribution of this program is now used for the distribution of iLotto, another ad-supported program. It is possible that the official installer will be revived, but, in the mean time, third parties might be spreading it successfully. Most users of DeepBlue Games are located in North America (USA, Canada) and the UK. It is most likely that this is because English is spoken in these countries. All in all, your geographical location does not actually matter much because this adware works in the same way regardless of where you live. It will install tracking cookies, periodically show ads, and help third-party advertisers promote their products. The services of this supposedly beneficial game manager primarily assist advertisers, not regular users, which is why we advise eliminating it as soon as possible. We have a few tips for you that will help you eliminate this adware. The first thing you should do is scan your PC for any other unreliable programs because – depending on how dangerous they are – you might have to eliminate them first. Automated malware removal software can help you identify and remove malware, as well as protect your Windows system from malware infiltration in the future. If you choose the alternative, which is presented in the guide below, you will need to erase all threats and keep malware away yourself, and that is not an easy task. 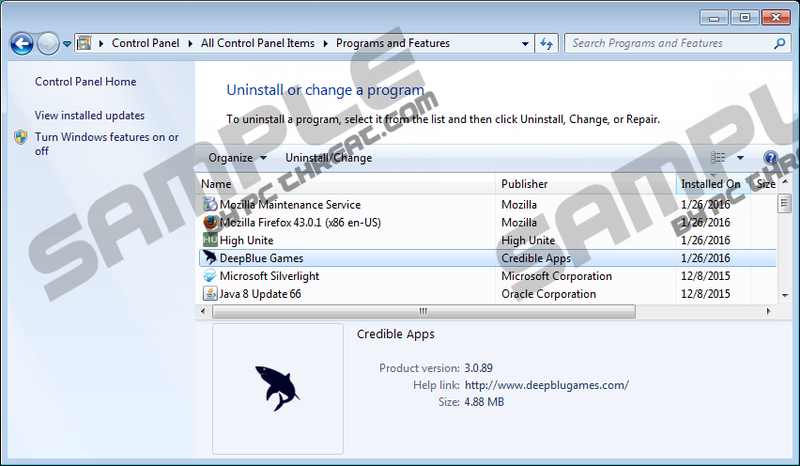 The instructions below explain how to delete DeepBlue Games from your operating system by erasing all components, which is good practice that you might find useful in the future; especially if you do not install reliable security software. Please follow the steps carefully, and scan your PC again to check for leftovers. Tap Win+R keys together to launch RUN. Right-click the key called “DeepBlue Games” and select Delete. Tap Win+E keys together to launch Explorer. Type %LOCALAPPDATA%\Google\Chrome\User Data\Default\Extensions\ into the address bar and tap Enter (note that the Default folder might be named after your Profile name). Type %APPDATA%\Microsoft\Windows\Start Menu\ into the address bar and tap Enter. Right-click the folder called “DeepBlue Games” and select Delete. Enter %ALLUSERSPROFILE% into the address bar and follow step 9. Right-click and Delete the folder with a random name (e.g., pfvHgouJXC). Quick & tested solution for DeepBlue Games removal.